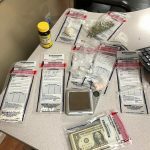 LONDON KY—On Wednesday, April 25th London Police were dispatched to the Red Roof Inn regarding suspected drug activity that led to an arrest. 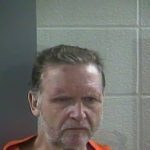 Upon the arrival of Police, they made contact with Ronnie L. Bowling, 62, of London who had three active warrants for his arrest and two EPO violations. Ofc. Cody Faulconer arrested Bowling while Ofc. Mike Holliday remained on scene. Hotel management stated that illegal drugs were believed to be in Bowling’s room and a search warrant was obtained by Det. Daniel Robinson. Once inside the room, Det. Robinson located approximately 11.79 grams of Marijuana, 15.73 grams of Methamphetamine, 66.5 white Xanax bars, six Hydrocodone 7.5mg, one Oxycodone 10mg, and a pipe used for smoking methamphetamine. Officers also located $2,312 in Bowling’s possession. Bowling was charged with first-degree trafficking in a controlled substance, possession of marijuana, buying/possessing drug paraphernalia, third-degree possession of a controlled substance, second-degree disorderly conduct, resisting arrest, and third-degree trafficking in a controlled substance. He was lodged in the Laurel County Detention Center.